With the Obama administration, like so many before it, embracing the delusion of a political solution in the Middle East, Maya Productions provides us with a timely opportunity to revisit the roots of that conflict in Conviction, now running at Curious Theatre Company. Based on a true story of an Inquisition-era priest who discovers his Jewish roots, Conviction reminds us of the intolerance of the Roman Catholic Church for dissent and the lethal penalties it routinely assigned for any transgressions. 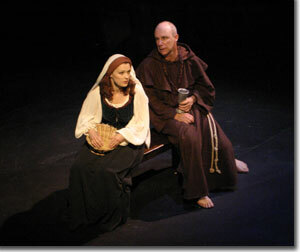 The script, adapted by Ami Dayan and Mark J. Williams from the Hebrew novel of the same name by Yonatan Ben Nachum, moves betweem a present-day library that houses case files from the Inquisition and a re-enactment of events from one of those files. The action takes place between 1485 and 1486 in Spain, almost 200 years after Jews, Christians, and Muslims lived and flourished together. Resentment towards the material success of the Jewish population fueled by inflammatory speeeches and sermons of the Roman Catholic clergy, resulted in the slaughter, exile, and conversion of hundreds of thousands of Jews. Priest Andres Gonzalez (Dayan) is on his way with parishoners to burn down the house of a red-haired Jewish woman, Isabel Marquez (Julie Rada), whom they consider a witch. Everyone who accompanies him turns back out of fear, so he is left to face her himself. In the ensuing conversation and the relationship that follows, Isabel gets Andres to revisit and rediscover the faith of his ancestors who were forced to convert. The story, which also has been and continues to be performed by Dayan as a one-man show, thrives in this new version, reconceived by Dayan and Jeremy Cole as a four-hander, by refining the voices and creating a parallel between the present-day interrogation in the archives and the 523-year old confession in the church. The Director of the Spanish National Archives (Michael Shalhoub) is both accusatory and compassionate as he cajoles Israeli professor Chaim Tal (Robert Mason Ham) for a confession. The professor has attempted to remove a file from the archives; he is now silent. Ham says much without saying a word, creating anticipation for a tragedy that is just beyond the horizon, that of Andres and Isabel. 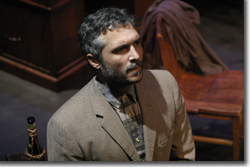 Like Ham's Chaim, Rada's Isabel says little and accomplishes much, setting up Dayan to transform Andres from a fearful priest to a life-embracing husband and father. Before there is healing in the Middle East, there must be forgiveness on all sides. The unanticipated events that conclude Conviction shine a light on how the pain of age old transgressions can begin to be relieved. 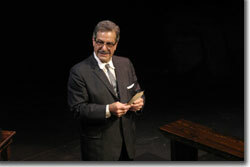 Maya Productions Conviction runs through July 12th at Curious Theatre Company. 303-623-0524.